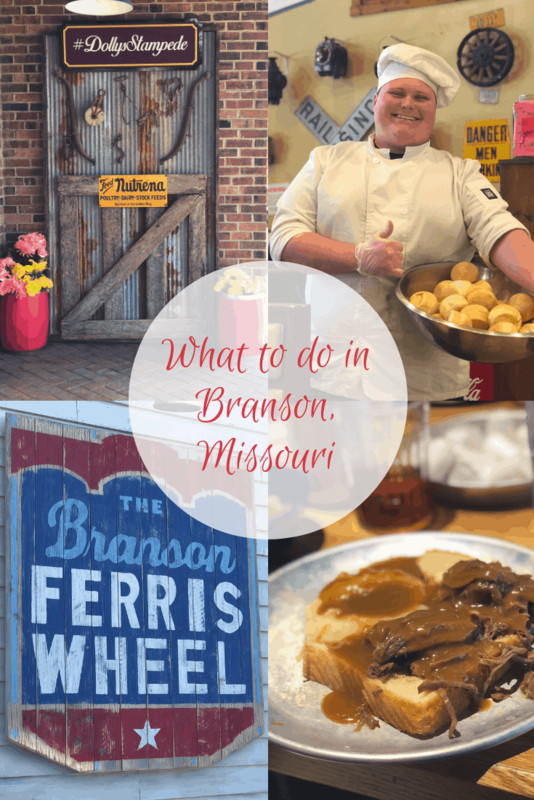 Recently, I was invited to Branson, Missouri to experience everything it offers. We were hosted by Stone Castle Hotel and Conference Center in the heart of Branson. Branson has always been interesting to me, since my mother was born in Kansas and my grandparents are from Arkansas and Missouri. I was excited to go, since I sadly never get to visit many flyover states. If you’re considering a visit to Branson, here are ten things you might want to do and see. Plus, we’re giving away a trip, so you can experience many of the things that we did too! Stone Castle is located in the heart of Branson. It’s a unique hotel that offers several fun “themed” rooms to choose from. This family-friendly hotel will give you a great night’s sleep, and offer you a hot breakfast in the morning to start your day. This 1880s theme park will offer an adventure for the whole family. Get lost in the caves, ride the rides, and eat all the unique foods they offer. If you’re feeling adventurous, don’t miss out on the famous Time Traveler ride. Enjoy local country music celeb Clay Cooper at his nightly show. Clay Cooper’s Country Express will entertain you with singing, dancing, and keep you laughing. You can find more of Clay over at the Stone Castle Hotel where Clay personally had his hands on the Clay Cooper Suite. Home of the tossed rolls, you’ll also get a special treat if Jeremy is around to sign his heart out. The food is really great, the atmosphere is fantastic, and the entertainment is a bonus. My kids would love to try to catch a roll or two! You can see how amazing Jeremy was in our video. The Titanic Museum was a really pleasant surprise. It’s full of artifacts and stories about the ship and its passengers. I highly recommend taking the tour so you can get the most out of the experience. Upon entry, you’ll get a boarding pass that you’ll keep with you to the end. At the end, find out if you survived the worst ship disaster in history. Branson’s Famous Baldknobbers, featuring the Mabe family, is a country music and comedy variety show. The show is performed in the new Branson Famous Theatre. The Mabe family began the Branson family entertainment phenomenon 58 years ago in 1959 and is still performing country, gospel, and comedy routines daily. This complex felt like an old-school craft mall with a hip new theater. It’s really a great place to spend the day shopping, watching a movie, and getting a home cooked meal from McFarlands. We enjoyed a Branson IMAX exclusive, Ozarks: Legacy & Legend. This film is available for free most mornings at the IMAX theater. It’s a great introduction to the history of the Ozarks. This fun park offers go-cart racing, an arcade, and the famous Branson Ferris Wheel. Get a birds-eye view from the top of the Ferris Wheel. Afterward, enjoy a frozen custard from Andy’s. This dinner attraction was a lot of fun. However… there will be no silverware to eat with. You enjoy your entire meal sans cutlery giving new meaning to the term “pull-apart chicken.” Alongside your meal, you’re entertained by a show featuring horses, dogs, and cute little pigs. This show is high-spirited and offers a world-class performance. I loved that they take such good care of their animals, you can tell they are all well-loved. This family was born to entertain for sure. Put this show at the top of your list, it was one of my favorites. I wish my daughter had been there with me. This family of 50+ sings, dances, and entertains you all night long. You’ll find yourself singing along and tapping your foot. After the show, you’ll feel like you’re part of the family. Branson is such a great place to take your family for a unique vacation. We want you to be able to experience the fun of Branson as well. We’ve partnered with Stone Castle Hotel and Conference Center, The Hughes Music Show, and Clay Cooper to give you the ultimate Branson experience. Half Crazy Mama and I will both be giving away this awesome trip! I’ve been to the stone castle hotel we stayed there on our honeymoon almost 12 years ago we loved it! Silver dollar city is so fun! Also seriously Andy’s frozen custard is seriously the best place ever nothing else compares!!!!! Great article on Branson, Missouri! We’ve been to Branson quite a few times. It is a great place for a family vacation where you don’t have to worry about your kids seeing a bunch of inappropriate things. I would love to win a get away for my family! With everyone working it’s hard to spend time doing fun things together! What a great list! I have a friend who lives in MO and she highly recommends Silver Dollar City. Yes I love going to Branson with my family. My sons really enjoy it. Ahhh! This is drivable for us now, and it would be such a fun trip for the family. Thanks for the opportunity to win! We have never been to Branson! But have been to Missouri many times and would love to visit! We visited Branson a few years ago. It ended up being so cold and rainy the entire time. I would love to take my family back so we can actually experience more of what the town has to offer. Thank you for doing this giveaway! We only live a few hours from Branson and it’s our go to place for a little getaway now and then. Every time we go there is something new to try out.